We are turning off wall posting for the weekend. Have a good one and we will be back on Monday. If you want to send a message of support to Gerry and Kate, please visit our Web site. Anything urgent, please email us at Webmaster@findmadeleine.com. ‎@Rachel, write to our Campaign Coordinator. We don't actually sell the ribbons, but she may be able to put you in touch with someone that makes them. Webmaster dose that mean they not taking a dna test for the girl in india? @Liam & Mirlian, we have not heard of any DNA testing being done. Gerry and Kate looked at a picture of the child and it is not Madeleine. Remember, Madeleine has a mark in her right eye that runs through the iris. It would be very easy to see this in a picture. 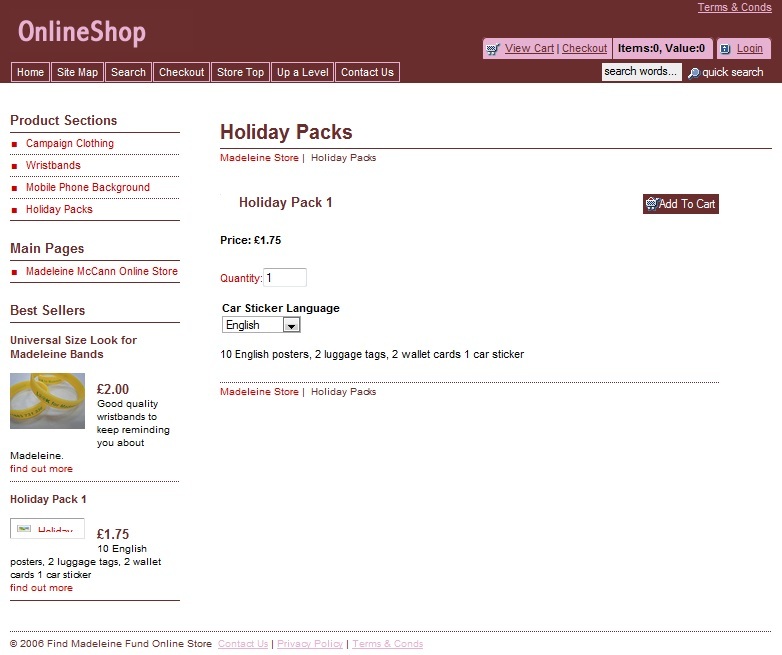 am going on holidays how can I get one of those packs?what web add ? Lou, you can order one from our online store. Link is to your left under our book promo. 'This incident is not in my knowledge and I have not sent any request to anyone for this. We have not taken any swabs for DNA testing. We have not even been approached for any help by anyone in this case." He added: "If anyone wants our help, we are willing to help but as of now, we have no...t been approached. My men are not at all involved in any such investigation." DEAR GOD! WHY? Is this another inept police force! PLEASE take the DNA of this little girl. Webmaster, please forward this to Kate. have you got a photo of what the car stickers look like please? Write to our Campaign Coordinator at campaign@findmadeleine.com​. She should have an image of the car stickers. have you got a picture of what the new posters look like and the ones in the different languages? Campaign Chloe, all of our posters are on our downloads page. Are you going on holiday soon? If so, please consider ordering a holiday pack and keep Madeleine's profile high. Thanks! 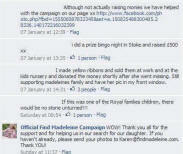 Find Madeleine Fund Online Store Holiday Packs store.findmadeleine.com..
Just send a note to campaign@findmadeleine.com​. ‎@Mariann, please send an email over to our Campaign Coordinator at campaign@findmadeleine.com​. She will get your order all sorted. Huge thanks to the Stobart Group for their support in the search for Madeleine. Check out their new trailer. Hi Kaylie, write to campaign@findmadeleine.com​ and we will get you setup with a t-shirt. Regarding the question yesterday about Gerry doing a bike ride from Portugal to England. There is no plan to do a charity bike ride at this time. Are there still new leads that come in concerning Madeleine? i'm pretty disgusted that Portugal was voted as second best destination for people with children on summer holidays, as lots of people have jetted off on their hols early they have chosen it as second best?! are they mad?! i'm not planning on taking my child to a country where they couldn't give a crap about the tourists and only about their reputation in the eyes of others! they have done nothing but hinder your hunt for precious Madeleine and I for one will not be funding their economy when they sure as hell do NOT deserve it!! @Sofia, Gerry said this was something they were looking at last year before the book. They did delay the book launch due to the royal wedding, but I don't recall hearing about the bike ride. I bet your the only person there to do so, they want nothing more than to brush it under the carpet and concentrate on making money again, regardless of whether it puts their tourist's and even resident's children in danger! they should be ashamed of themselves!! but thats the problem, seems they are just as heartless as they are useless! That sounds like an awfully long bike ride Gerry. i would never holiday in Portugal with my child and I feel more strongly about this after reading the book. unfortunately Sofia, innocent people always suffer. Since Madeleine was abducted, it has been revealed that Portugal is a peodephiles haven. Would you seriously consider taking a child there? You can't watch them 24/7. Maybe the people of Playa da Luiz should rise up and demand change? Yes, its fair if it protects your children! Faye, our investigators are still looking for Madeleine, but the Met is doing a review of all evidence. Are you still taking the petitions? I have a few it's just i taught they were for the review and now that they are doing the review , i'm not sure. Hi Victoria, <----- look to your left under the picture of the book. You can find many different types of downloads including luggage tags under Campaign Downloads. You are very welcome! And thank you for downloading the luggage tags. What is happening with that sighting in Leh? Is it true that they are doing DNA or is it just false reporting? Susan, as much as we would like to comment, we cannot discuss investigation-related info on this page. Thanks for understanding. I understand.I just wish this little girl could be found. is your book still available on amazon....? Webmaster have we any information on when Gerry's bike ride from Portugal to England will be taking place ? What a wonderful way it Would be to raise awareness of Madeleine and if we all sponsored him to raise money for the fund. Let me check with Gerry on that. I will get back with you. 21 hours ago via iPhone. Charlie, please send an Email to campaign@findmadeleine.com​. We are still having problems with PayPal. ‎@Mandy, please email us if you have any info. As you can see, we have turned wall comments back on. There may be times when we turn them off due to us being unavailable to monitor. So please bear with us as we try to balance our Facebook presence with other areas of the campaign to find Madeleine. Mandy, please email us if you have any info. @Helena, we know you are being supportive and we are grateful. Gerry and Kate have asked us to not highlight videos with other children from their family and extended family. Out of respect for their feelings and privacy, we ask that videos not include other children from their family. Thanks for understanding. We would like to thank Nigel Graham for his lovely song for Madeleine. Check it out and pass it on. We’re Still Looking for You Madeleine has received thousands of hits from eager fans, who can either listen to the song or download it for free. ‎@Lorraine, please send an Email to Campaign@findmadeleine.com​. Our Campaign Coordinator will get your order out immediately. FAO Webmaster: Just tried to purchase from the online shop via PayPal and received this error: An error received from PayPal Pro Website Payments. Try again or select a different payment method. The error was: User authentication failed. ‎@Lee and Devon, we will look into it. Thought we had this fixed last week. Thanks for letting us know. Amanda, it's alright for Devon to post here about the store. We have been having problems with the store. It's something on paypal's end and we have to tell them it's an issue. Thanks ladies for letting us know. Webmaster, how about some Madeleine stickers in various sizes for letters, parcels etc? Joan or anyone else, send us a note at our webmaster address and we will send you the file. We already have them created. will put them on the Website tonight and put a link here. They are a download. Sandra, great suggestion. Also, if someone invites you to be a friend, you can check their friends list to see if someone in their list is someone you should be wary of. You can check someone's friends list quickly by just typing in the name when pulling up their list. Trevor, we are fine with this post. Trevor, we would love the help. Thank you. is this book only in english or can i buy it in norwegian? Right now the book is only available in English, Portuguese and Dutch. Danka, they will see it. Please just write to us via our Web site. an that be private or does every1 read it? It can be private. Just write to the campaign box and our Campaign Coordinator will make sure they see it. Danka, also send your note to campaign@findmadeleine.com​. This is a support page for the campaign to find Madeleine. This is not a page to find out information regarding the investigation. Questions or info related to the investigation should be directed to investigation@findmadeleine.com. 1. Please be polite and respectful. 2. Posts deemed spam, those containing vulgarity, racist, inappropriate comments, bullying, harassment or stalking, will be deleted. Anyone engaging in these activities will be removed from the page and banned from posting. 3. No attacks on members of the page, either as individuals or as groups. 4. No baiting, antagonising or harassment of any kind will be tolerated. 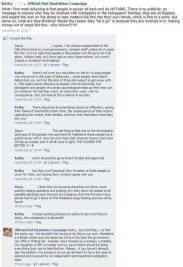 If it is perceived you are harassing other members of the page or the McCann family, you will be removed from the page. Anyone found to be maliciously copying content from this page or the comments held by members of this page without their permission, will be banned from this page and reported to Facebook for harassment and stalking. 5. If you have a serious problem/complaint with a post and wish to report it, please send an email to webmaster@findmadeleine.com and report via Facebook's report button. 6. Any conversations that descend into bickering, will be removed. This may entail the whole conversation being deleted. If we deem the person is deliberately causing havoc on the page, the person will be removed from the page and be banned from posting. 7. The Find Madeleine Campaign makes the ultimate decision on what remains up and what gets deleted. It's our page, and we determine the tone and content on the page. 8. We welcome all ideas. Ideas means ways to find Madeleine; not criticising what has been done in the past. Questions asking about certain aspects of the investigation, will be deleted. They are not to be posted on an open page. 9. If you have a question about Kate's book or any other questions not related to support of the McCann family and ways to get Madeleine home, please do not post them on an open page. Send an email to campaign@findmadeleine.com we will do our best to respond to your email. Please understand that if your question is related to the ongoing investigation, because of privacy issues or the sensitive nature of the investigation, we may not be able to answer your question. 10. Please do continue to help us in our search and we welcome ideas and ways to help find Madeleine. Remember, this is a support page not only for Madeleine and her family, but also those that truly want to help get Madeleine home. Thank you for caring about Madeleine and for your help. Clare, please write to me at Webmaster@findmadeleine.co​m. Hi Everyone, Webmaster here. I've already talked with Ann. She was never blocked from this page. 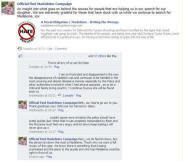 Some unscrupulous people reported her to Facebook and her account was suspended. We are in contact with Facebook trying to get her account reactivated. Hi Christine, there was talk on here earlier about Annn being blocked. People were concerned that we had blocked her, but it wasn't us on this page but an automated process on Facebook's part that suspended her account. Hannah, Ann is an ardent supporter of this page. She wasn't blocked by us. Ann was defending Kate on some other pages and unscrupulous people from those pages kept hitting the report button and Ann's account was suspended. Christine, thank you. Don't be too hard on Michelle. She's just trying to help just as you are. She and others are frustrated with some people coming on here to cause havoc. There was a misunderstanding and people thought we banned Ann. We ...would never ban Ann. It's horrible people taking advantage of FB's report feature. If someone gets reported too many times, their account gets suspended. We had nothing to do with it being suspended, but are trying to get it reactivated. Oh Ann I'm so sorry this is happening. I'm trying with our contact. She's in California so I'm hoping she will be able to get it resolved soon. She's very good at helping. I will keep you posted. 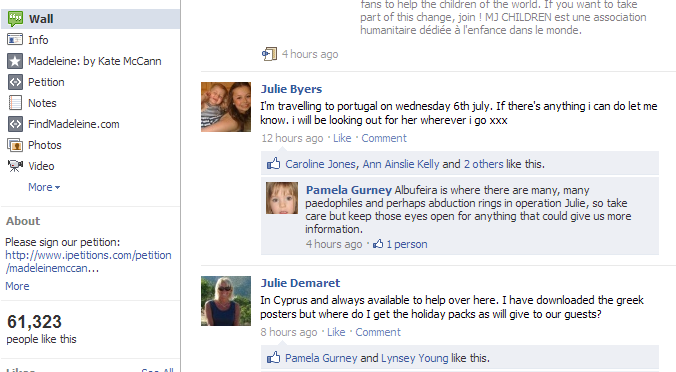 Albufeira is were there are many, many paedophiles and perhaps abduction rings in operation Julie, so take care but keep those eyes open for anything that might give us more information. ‎@Sophie, we are sending you a hug. Thank you Lauren for the prayers. We recently spent a couple of weeks in a village close to Praia da Luz and I was pleased to see Kate's book on a major display in the big Intermarche supermarket in Lagos. We return there in a few weeks and I shall check to see if it is still being promoted. Hopefully it is, as that will be a sign that the message is still getting across in the very heart of the area where this all unfolded. Thanks Colin for keeping your eyes open in PdL. We still believe the missing piece to the puzzle is in PdL. The trial for the kidnapping of Denise has been postponed to 5 May and the defendants Jessica Pulizzi, 22, sister of Denise, accused of complicity in kidnapping, and the former boyfriend Gaspare Ghaleb, 24, Italian-Tunisian accused of having given false testimony to prosecutor. Steve, took a look at the work you and your group are doing. Very impressive all of the missing children you are highlighting. Keep up the great work. From our friends at Madeleine-Writing the Wrongs. There are hundreds and thousands of folk walking around out there bliss unaware of Madeleine's plight. Lets reach them somehow. Carry your book around, Tie that yellow ribbon for Madeleine. anywhere it can be seen, put up a cxar sticker, TALK about her to others and show that you care about her. Make people understand that there IS hope. We must join all forces we have, in whatever way we can to motivate each other and others to find her. God bless you Madeleine. We will look,and look until we find you, lovely girl. This is the Webmaster. Let's do our best to not highlight or comment on those that distract us from our mission of getting Madeleine home. I know what they are saying is hurtful, but nothing they do, say or copy from here and mock is ever going to hurt as much as having Madeleine away from her family. Let's keep our focus, stay positive and not let hateful people even occupy our thoughts. Since the Big Tweet for Missing Children - 6 of the children that you joined the search for have been found. Now let's get Madeleine home too. We love this idea. Thanks Cherylmarie for suggesting it. Iris, thank you for sending us the picture of the lovely rose from your garden. Also, thank you to all that have sent in pictures for our digital scrapbook. K.
Michelle, please take lots of pictures and keep sending us updates via our Webmaster@findmadeleine.com address. We want to include everything you are doing in our digital scrapbook we are putting together for Madeleine. For those of you going on holiday, you can download our posters at our website (http://www.findmadeleine.com/support/downloads.html) or you can purchase travel packs. Tried to order a holiday pack + wristbands paying via credit card, I don't have a paypal account. But that didn't work either :-( What do we do??? Please write to us at Campaign@findmadeleine.com. Our Campaign Coordinator will get it all sorted. Dawn, there is a team at Scotland Yard that are now looking for Madeleine. We want to highlight ways many of you are helping in the search for Madeleine. If you have pictures or videos, please Email them to us at Webmaster@findmadeleine.com. The power of social networking can bring children home. The National Center for Missing and Exploited Children (NCMEC) has recognized the great opportunity social media outlets hold for finding the thousands of children who go missing each year. Iris, thank you and we have your picture and will put it up as soon as Gerry and Kate can see it. 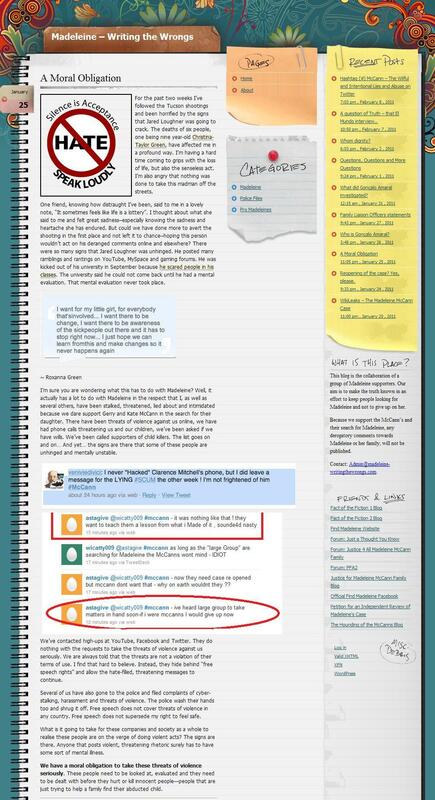 I wonder if they are still looking into the girl who was pictured in Sweden at the car show in 2009? Martha, this was looked into. That child was not Madeleine. Hi everyone, FM Webmaster here. Gerry and Kate are still away, but I am passing on comments to them. Thanks for the continued support. ‎"Powerful... Kate's book blazes with the sheer, visceral force of her love for her daughter." Sandra Parsons, Daily Mail. ‎@Iris, that is correct. Gerry and Kate don't have the time to lose their focus. Their goal is to get Madeleine home and the rest is all just noise they tune out. Sandra Carter I forgot to add: The book (Madeleine by Kate McCann) is a definate must for every parent, especially of young children. Gabby, write to campaign@findmadeleine.com if you need it right away. Gabby, we haven't removed any posts today. For those of you that have read Kate's book, why not put up a review on Amazon? That way others can see the support from so many of you lovely people. Hi everyone, this is the Webmaster. Gerry and Kate are doing book promotions the next couple of days. Please continue to post all of your great ideas and I will make sure they see them. At present it has peachy pink and yellow colouring. It is delicate and very beautifull. :-). Iris, would love to see a picture. If you can post it on here so everyone can see it. I will pass on my book on with a written message inside for it to be read and passed on again. I have suggested to friends that want to borrow my book that they make a donation to the fund when doing so, and pass it on with the same message. 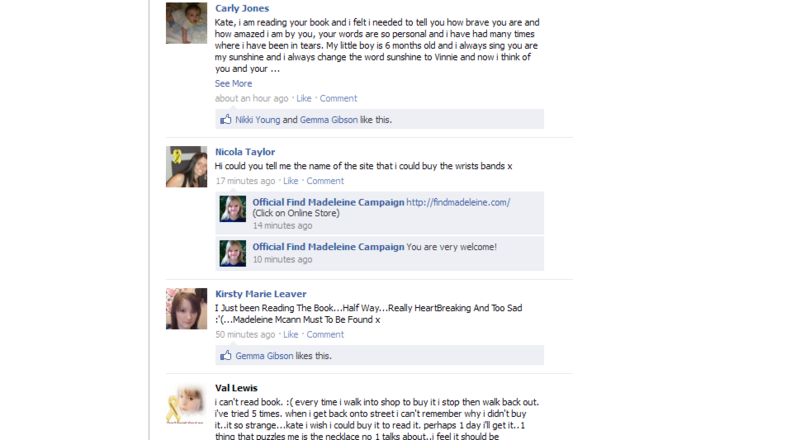 Catherine and Jacci, both are great ideas and what a lovely way to keep people looking for Madeleine. Kellie, thank you for the lovely note. I am really grateful for so many people standing with me. Our Webmaster deleted the post; so don't worry about it staying on here. People like that try to come on here and spread their hate, but we will not allow them to hijack our page or let people write our daughter off. Madeleine is findable and should be with her family. Anyone that says otherwise has their own agenda. Thanks Joan and Sally. 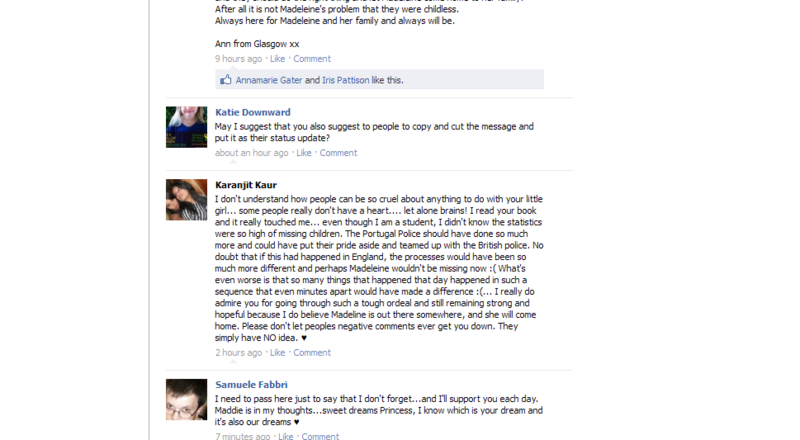 It is hard to stay positive, but Madeleine deserves this and she deserves to not be given-up on. Those people don't want her found. They would then be proven wrong in everything they have said and done. In the big picture though, they are unimportant. Giving them any sort of energy just validates them and feeds their hate. So let's do our best to stay focused on Madeleine. @Joan, I think all of you are amazing for sticking with us and for caring so much about our daughter. It means the world to me and Gerry to have people care and to keep looking for our daughter. Thank you Samuele, I see your posts almost every day. Hope everyone is well today. Thanks to everyone that has purchased or passed on my book. We are praying it leads to that vital piece of the puzzle in getting Madeleine home. Nicky, let us know if this person or anyone else continues to harass you. 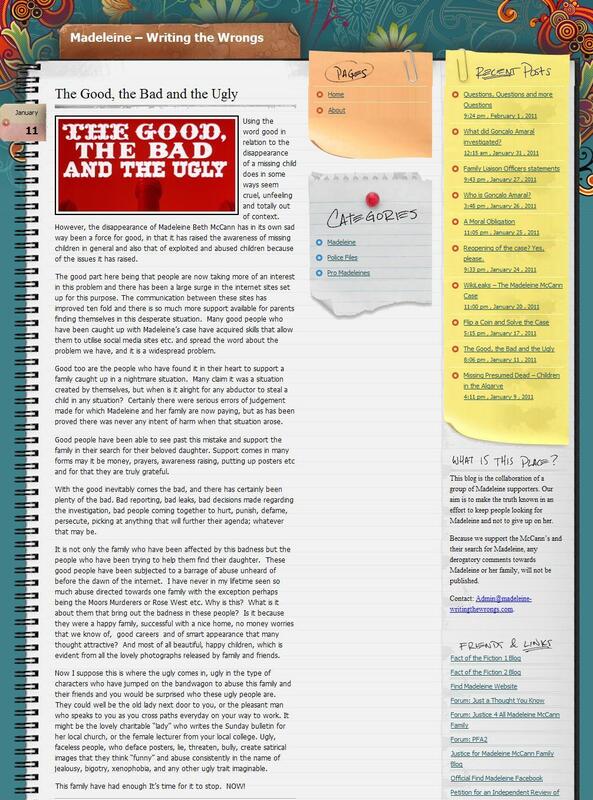 We will have our Webmaster ban them from this page. Thank you all for the lovely notes. It was a hard day without Madeleine. They all are, but especially days where we are supposed to be spending it together as a family. Thank you all for the lovely messages of support and Father's Day wishes for Gerry. We had a nice day with Sean and Amelie and everyone is all tucked into bed. Sleep well everyone. Just popping-in to say hello. Another busy day and busy weekend. Happy Father's Day to all of you dads. There is currently no legislation to protect missing people and their families left behind. If your house is burgled you are automatically offered victim support with emotional, practical and legal assistance. If your child goes missing you may get nothing. This Parliamentary Inquiry has the potential to change that. When someone you love goes missing, you are left with unimaginable, unending heartbreak, confusion, guilt, and worry. In addition to the reassurance that everything possible is being done to find their missing loved one, families need support. And they should be spared the additional pain of financial and legal bureaucracy. By being here today, Nicki, Sarah and I hope to make a difference. We did not choose to be figureheads for this devastating issue; that fate fell to us the day Luke, Quentin and Madeleine disappeared. If you have pertinent info about Madeleine, please do not post it on here. Please send an Email to investigation@findmadeleine.com. Copy-in campaign@findmadeleine.com & webmaster@findmadeleine.com. The people monitoring these boxes will make sure what you send in is looked into. Thank YOU! Thank you all for the birthday wishes. If you have info investigation related, please send to our investigation Email address (investigation@findmadeleine.com) or fill-out the form on our Web site. All info coming in is cataloged and put into a database. Thank you! Just popping in for a few minutes. If you want to help us in the search for Madeleine, write to Admin@helpingtofindmadeleine.o​rg. They help us with our awareness campaign. Also, thank you all for the birthday wishes for Gerry. Good afternoon everyone. Another busy day. Gerry's birthday is on Sunday; so our weekend will be spent with family and friends. ‎@Janet, we do post on Portuguese FB pages. Would be lovely if you all would "like" our PT page too. Hi everyone, this is the Webmaster. Kate asked me to post because she has been very busy today. We've had questions in our inbox regarding how to share the videos. You can either share the videos by clicking on them on here and click on the share button or you can go to our Web site. If you click on the YouTube button on each video, you will be taken to YouTube and there is a share button on each of the videos. Tracey, please thank your daughter for all of the videos she's made and for caring so much about Madeleine. We have no issue with anyone making videos as long as the material isn't copyrighted to someone else (as the latest videos are) or use our other children or children from our extended family in personal videos. 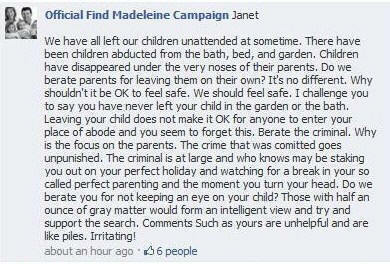 We are grateful for people like your daughter keeping Madeleine in the public eye. Sorry for all of the posts about the Big Tweet. When we were trying to post it, FB kept freezing on us. We didn't realise it posted so many times. Help find missing children by retweeting appeals on International Missing Children's Day (IMCD). Thank you! Missing People offers a lifeline for the 250,000 people who run away and go missing each year. We also provide support for family and friends. I don’t understand how people can be so cruel about anything to do with your little girl… some people really don’t have a heart---- let alone brains! I read your book and it really touched me… even though I am a student, I didn’t know the statistics were so high of missing children. The Portuguese police should have done so much more and could have put their pride aside and teamed up with the British police. No doubt if this had happened in England, the processes would have been so much more different and perhaps Madeleine wouldn’t be missing now :( Whats even worse is that so many things that happened that day happened in such a sequence that even minutes apart would have made a difference :(… I really do admire you for going through such a tough ordeal and still remaining strong and hopeful because I do believe Madeleine is out there somewhere, and she will come home. Please don’t let peoples negative comments ever get you down. They simply have NO idea. Some of you have had questions about the book and the price you are paying at the till and how it affects the contribution to the Find Madeleine Fund. The price at the till makes no difference to the royalty payment, and hence, the contribution to the Fund. ALL royalties from the book sales (in any country) go to the Find Madeleine Fund. This is the FM Webmaster. Gerry and Kate wanted me to thank everyone for your continued support. They cannot post this weekend due to book interviews, but will be back online after Monday. Hi everyone, have a really busy day and weekend with interviews. Thank you to all who have purchased our book. Can those of you that purchased our book from places not on our list, let us know where? We will update our book page with the information; so others can purchase. Thank YOU! Thanks Clare for reminding people how to get hold of us right away. 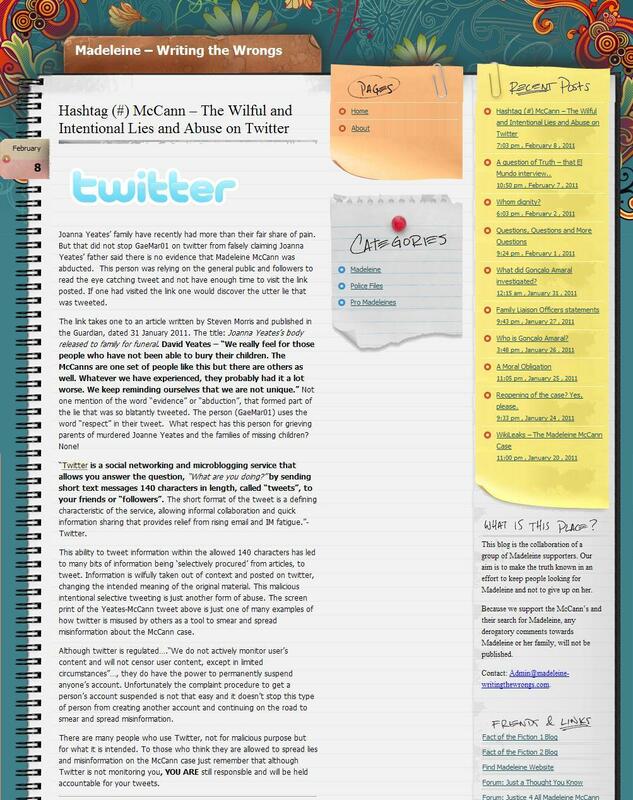 Please Email us at Webmaster@findmadeleine.com if you see anything on this page that needs to be addressed right away. This is fair warning to anyone that comes on here to post hateful comments. This is OUR space. We determine the tone and content. If you post hateful, libelous comments, your comments will be deleted and you will be banned. Just popping-in because we have a number of interviews we are doing today. Thank you all for the lovely birthday wishes for our daughter. We miss her beyond words. We are grateful for all of the support you all have given us these past four years. You keep us strong. We are checking with CNN to find out if the interview will be online after it is aired. Will get back with you all shortly. Don't forget for those that are up or in other time zones, our interview with Piers Morgan will air on CNN at 9 PM ET. Stay tuned for the picture to put on your profile. We should have it out to everyone by tomorrow. I haven't been using this page for very long but I am rather concerned that I have received several friends requests from what appear to be very young girls. While not wishing to appear unfriendly, as I have photos of my children on my page, I only have close friends and family as friends. i ordered 3 travel packs and 3 bracelets 3 weeks ago and paid by paypal, not receieved them yet pls when will i get them? and we will look into why you haven't received your tavel packs. I wonder what to do on the 3.mai ? I wanna do something big for Madeleine! Helena, stay tuned. We are putting the final touches on something for Tuesday. I would like to encourage everyone to change their Facebook profile picture to one of Madeleine on the 3rd May until her eighth birthday on the 12th May to show our support for her and her family. This will gather a lot of support without a doubt! please pass it on to all your friends. We want it to spread out worldwide. This seems to be working and hopefully by May3rd her face profile will be spread far and wide. Please, I ask everyone to support this to show that we really do care about this innocent child and that we won't give up on her or her family. We are working on a pix to use. Stay tuned. 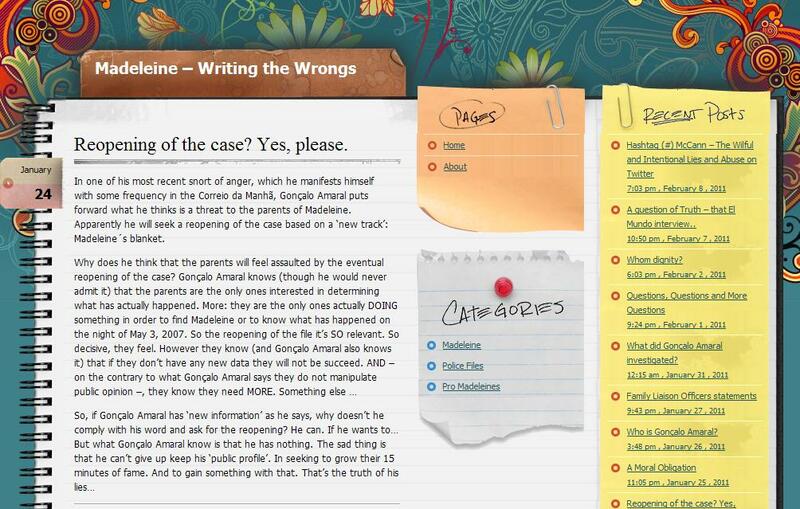 From our friends at Madeleine-writing the wrongs someone, somewhere, know where Madeline is. 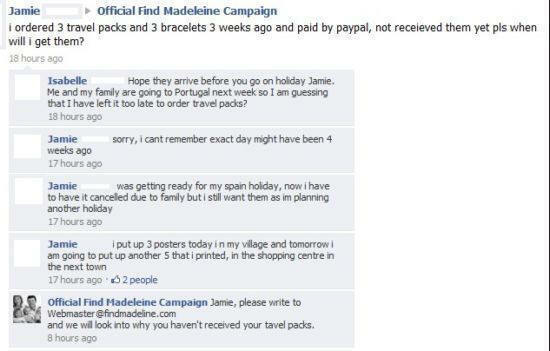 Clare and anyone else that is still waiting on bracelets, please send us a note at campaign@findmadeleine.com. We will look into why you haven't received your bracelets yet. I beg to differ!!!! I was a first time mum when I was only 19 years old and my second baby at 22 and I too went on holiday with my husband and them but NEVER for a moment did I ever think of leaving my beautiful girls in a hotel room!!! We have all left out children unattended at some time. There have been children abducted from the bath, bed and garden. Children have disappeared under the very noses of their parents. Do we berate parents for leaving then on their own? Its no different.. Why shouldn't it be OK to feel safe. We should feel safe. I challenge you to say that you have never left your child in the garden or the bath. Leaving your child does not make it OK for anyone to enter your place of abode and you seem to forget this. Berate the criminal. Why is the focus on the parents. The crime that was committed goes unpunished. The criminal is at large and who knows may be staking you out on your perfect holiday and watching for a break in your so called perfect parenting and the moment you turn your head. Do we berate you for not keeping an eye on your child? Those with half an ounce of gray matter would form an intelligent view and try to support the search. Comments Such as yours are unhelpful and are like piles. Irritating! JK Rowling is 'not helping write our book about Madeleine. There is no truth in reports that Harry Potter creator JK Rowling is helping Kate McCann write her book about her missing daughter Madeleine, a family spokesperson said last night. Missing people offer a lifeline for 250,000 people who run away and go missing each year. For those left behind they provide specialised support to ease the heartache and confusion, and help search for their missing loved ones. 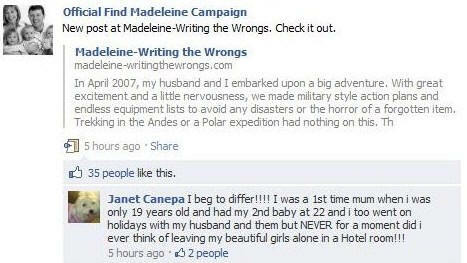 From our friends at Madeleine-Writing the Wrongs. Some one, somewhere Knows where Madeleine is. Through the course of my work my husband and I meet lots of ‘new’ people. The yellow and yellow and green wrist bands that we always wear to signify our support for the search for Madeleine sometimes (sadly less now than in the eary days) generate interest and offer up an opportunity to remind. Please remember Madeleine is part of a family and we want her back. Help us by signing the petition for an independent review of Madeleine's case. Thank you! Eddie the infallible? – The real scandal of cuddle cat - Madeleine-writing the wrongs. Thank you everyone for the comments. Rest assured, our investigation team is looking into the latest info from Marcelino Italiano. What i find most sickening is that people in power sit back and do NOTHING. There is no publicity, no message to anyone who may be involved with kidnappers or the kidnappers' families, they are so flippant, and expect the man on the street to take matters like this into their own hands, which is fine to a point, but come on, what are they thinking? Maybe the reason they "let it go" is because they are involved in or making money out of cases like this.. who knows???!!! Kathy, Jacci and Mary, we feel the same way. We shouldn't be having to do this on our own. Madeleine is a British citizen and she deserves to have the best the government can offer in finding her. Instead, she's treated as a number; a statistic. Our daughter is NOT a number and our government should be doing everything they can to help find her. Please...if you haven't already, sign the petition. Put pressure on our government to have the case re-opened and reviewed by an independent and impartial investigation team. From our friends at Madeleine--Writing the Wrongs. From our friends at Madeleine--Writing the Wrongs. What did Amaral investigate? In his own book, on the cover that sums up his intentions, he writes "a criminal investigation is only committed to the pursuit of material fact. It shouldn’t worry about political correctness." We are asking English and Portuguese to sign the petition to have the case re-opened. If you know of anyone that hasn't signed the petition, please ask them do do so. The petition can be found on the tab above. Beth, our hearts go out to you. Thank goodness your child was not harmed or taken. From our friends at Madeleine-Writing the Wrongs: If Gonçalo Amaral has 'new information' as he says, why doesn't he comply with his word and ask for the reopening? He can. If he wants to... But what Gonçalo Amaral knows is that he has nothing. In one of his most recent snort of anger, which he manifests himself with some frequency in the Correio da Manhã, Gonçalo Amaral puts forward what he thinks is a threat to the parents of Madeleine. Apparently he will seek a reopening of the case based on a 'new track': Madeleine's blanket. We know Madeleine is out there waiting to be found. We just have to keep forging ahead to get her home. It does give us hope and is an amazing story. Chinese would be good too. Let us know at Webmaster@findmadeleine.com. Thanks everyone for the feedback. Thanks Ann and Sharn. We actually have the poster translated, but we are having problems with getting it into Photoshop. There is an Arabic version of Photoshop that will do the writing from right to left, we just don't have access to that version of the application. If someone has Acrobat in Arabic, that may help too. If you speak/write Arabic and have a software application that can help us with our Arabic posters, please contact our Web team at Webmaster@findmadeleine.com. Many thanks! Good people have been able to see past this mistake and support the family in their search for their beloved daughter. Support comes in many forms may it be money, prayers, awareness raising, putting up posters etc and for that they are truly grateful. From our friends over at Madeleine- Writing the Wrongs. Martina, if you (or anyone else) hear any additional info about these kidnappings in Tunisia, please let us know. You can Email us at Webmaster@findmadeleine.com. Thank you for letting us know too. WOW! Thank you all for the support and for helping us in our search for our daughter. If you haven't already, please send your photos to Karen@findmadeleine.com. Thank YOU! Have you done fundraising on Madeleine's behalf? If so, we would like to highlight your efforts in a piece we are putting together. Send your pixs to Karen@findmadeleine.com. Thank you! Thank you all for planning to buy our book. We will look into book signings when the time comes. We will most definitely let you all know if we do any. If you haven't had a chance yet, please sign our petition to have an independent review of Madeleine's case. You can access the petition via the tab. Thank you. Thank you all for the kind and lovely messages. thoes who have made mistakes along the way? What has happened to our sense of morality? Ways you can help... Add the petition info to your Christmas cards. Click on the petition tab for links to the online or downloadable version of the petition. We know many of you have signed the petition, but we need many more signatures in order for the government to take notice. Please send out to all of your friends, family and colleagues. We want our daughter home. Thank you to those that have signed the petition. Thank you to all for signing the petition. We have 28k signatures, but need a lot more to get the UK and PT governments to take notice. Please keep passing it on. Thanks for all of the support. We are extremely grateful. You all are amazing! Thank you! Let's keep it going. We need to get the government to take notice. We will not let them forget about Madeleine. We need your feedback. Do you have suggestions on how to improve the search for Madeleine or to keep the spotlight on her still being missing? We welcome any and all suggestions. Shoot us an Email at Webmaster@findmadeleine.com with your suggestions/feedback. Thanks. The Child Rescue Alert will be used by the police when it is probable that a child has been abducted and in imminent danger of serious harm or death. When the CRA is launched, the public will be notified via various media channels, including TV and radio, with broadcasts being interrupted on a regular basis, to ensure that as many people as possible are aware of the abduction and therefore able to help. The telephone number to call with information following an alert will be: 0300 2000 333. ‎(May 27) -- As Abby Potash pecked away at the computer in anguish, sending out messages asking for help finding her 10-year-old son, who had been abducted by his father, in another home a woman she didn\'t know scanned the mail and asked for some reading glasses. Tuesday (25th May) is International Missing Children’s Day (IMCD). This is a day when we remember all of those children around the world who are missing and separated from their families. It is also an opportunity for everyone to try and help these children and to make a difference to this vast and tragic global problem. Thank you to everyone that sponsored me in the cycling event. We are extremely grateful for your support. This weekend Gerry will be competing in the Etape Caledonia- an 81 mile (130km) cycle through Highland Perthshire with almost 2000m of ascent. Gerry is raising money for Madeleine's Fund- Leaving No Stone Unturned and would be grateful if you would sponsor him. Poster for Event Madeleine has been missing for just over 3 years and recently had her 7th birthday. This weekend I am competing in the Etape Caledonia - an 81 mile (130km) cycle through Highland Perthshire with almost 2000m of ascent. If anyone wants a travel pack, please write to our campaign manager at Karen@findmadeleine.com. Tell her you would like a travel pack and she will have one sent to you. We understand that some people do not have printers. We are extremely grateful for anyone that puts up a poster and remembers Madeleine. We have a new poster page up on the Web site. Let us know where you have put up a poster. Still Missing, Still Missed, Still Looking. Please do not give-up on Madeleine. Help us bring our daughter home. Why do we continue? There is absolutely nothing to suggest that Madeleine has been harmed. Madeleine is still missing and someone needs to be looking for her. She is very young and vulnerable and needs our help. We love her dearly and miss her beyond words. We welcome a review of all information held by law enforcement agencies regarding the investigation to find our daughter Madeleine. It is incumbent that the authorities continue to actively follow up leads which may result in finding Madeleine and those responsible for her disappearance. Please Don't Give Up On Madeleine The judge agreed there has been significant ongoing damage to the search for Madeleine and to our family, and we are grateful for that. If you feel you have seen Madeleine, please notify your local police immediately AND our Investigation Line at: +44 845 838 4699 or via Email at: Investigation@findmadeleine.com. 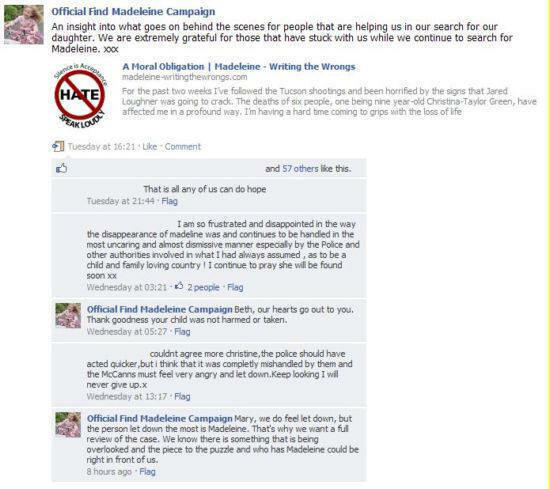 See FindMadeleine.com for more information. By upholding the injunction against Goncalo Amaral's book and DVD, the judge has rightly agreed that there has been significant, ongoing damage to the search for our beloved daughter Madeleine and to the rights of our family. We are grateful to the judge for accepting that this injustice must not continue. The court case has demonstrated, once again, that there is no evidence that Madeleine has come to any harm. It has also clearly shown that no police force is actively looking for Madeleine, even, shockingly, when they are presented with new information and leads. Kate and Gerry McCann have said they are "pleased and relieved" at a judge's decision to uphold a ban on a former detective's book about the Madeleine case. One thousand days. Madeleine is still missing and she needs to be found. We will continue to turn every stone. We will never give up on Madeleine. Thank you for your support and solidarity. Together we can bring Madeleine home. Helping to Find Madeleine (HTFM) is a not for profit organization, made up of a number of volunteers from all over the world. 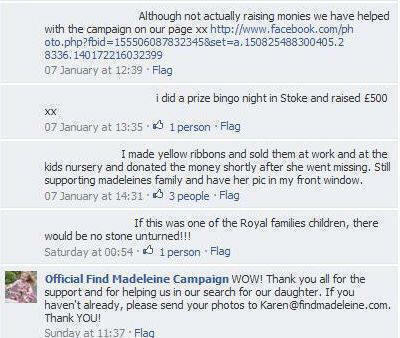 Its aim is to support the Find Madeleine Campaign in any way it can. For all of them, our thanks for keeping hope alive and helping us spread the word. Did you know that the European number for reporting missing children is 116000? The call is answered by a local team of specialists, providing psychological, administrative and legal support, if necessary. This line was created by the European Commission on May, 25 2009, and focuses on the importance of reporting cases across borders and acting quickly. ‎"Saying that the constitutional rights" can not be attacked "is to forget that among them, in addition of the freedom of speech, there is the good name and honor. And it’s in the equilibrium between one and other that lies the root of this case. (...) And if to Moita Flores (and Amaral and his publisher) a book exploring the possibility of a mother and father being the authors of a heinous act is so acceptable, I don’t understand why he is so revolted against a trial the , like he said, "mocked" Amaral to hypothesize that he has decided to make money and fame mocking the McCanns. Unless we have different weights for freedom and honor as they concerned "our" and “ the others". A matter of sympathy, so - but until we see, sympathy is not a constitutional right." Join the Official Find Madeleine Campaign Portuguese page. Freedom of expression and the right to respect and good name protection Had Gonçalo Amaral’s book brought any advantage to Madeleine’s disappearance investigation? Or it just enriched the author, publishers, consultants, commentators and those who gave them voice? We are sure that it is not difficult to understand the size of our open wound. Therefore, we have the right to defend ourselves in the courts from the attacks that have been submitted, whose decisions are supreme and free. What comes next, either for us or against us, it’s not censorship or undue advantage, it’s only the result of balancing freedom of democratic standards and fundamental rights to which both we and the author of the book are subject. The provisional decision of taking the book have already two judicial seals and can and should be disclosed for all citizens’ interest that in the name of freedom of expression are at risk of being publicly accused for life after been acquitted by the courts. We do not sell that decision anywhere, unlike the author of the book, at least until the suspension of the same. As our conversations with journalists, whether formal or informal, do not happen in return of financial compensation, contrary to Gonçalo Amaral did or tried to. Add the Madeleine banner to your Facebook profile. Ten Ways You Can Help in the Search for Madeleine. Many people have been deeply moved by Madeleine's abduction and subsequent separation from her family and have asked us how they can help us in our search to find her. Please pass the balloon on. If any of you speak multiple languages, can you let us know? We want to send out the CEOP video in other languages. Send us a note here on Facebook.